Offering free internet access to its guests, Hotel Island Star is located at a distance of 1 km from the Seetha Theertham Bus Stop and 0.5 km from the Arulmigu Ramanathaswamy Temple.This hotel in Rameshwaram comprises of 45 rooms spread across 3 floors. Each room is equipped with amenities such as wake-up calls, bottled drinking water, chair, wardrobe, television and bathroom.This Rameshwaram hotel features a restaurant. Facilities such as 24-hour front desk, security and power backup generator are provided. 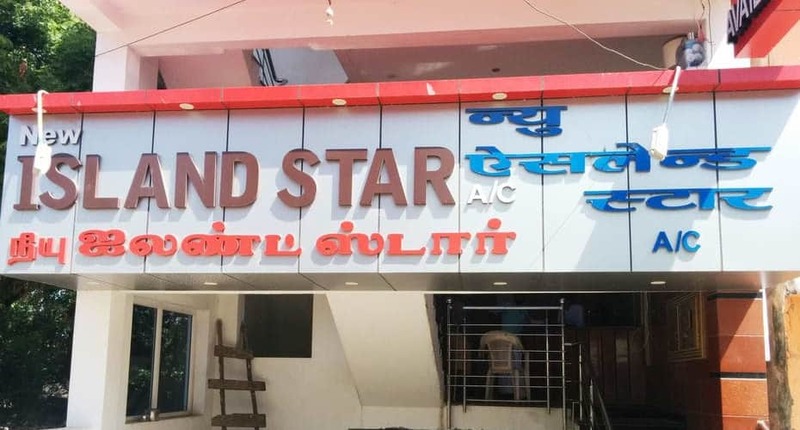 Laundry, medical assistance and room service for limited hours are also offered.Hotel Island Star can also be reached via Rameshwaram Railway Station (1 km). Guests can also visit Dhanushkodi Beach (8 km), Rose Garden (18 km), Kushi Beach (29 km) and Rameshwaram Pariharam (0.1 km). Full refund if you cancel this booking by 26-Apr-19 12:00 PM IST. No refund if you cancel this booking later than 26-Apr-19 12:00 PM IST. What needs to improve : I dont liked anything other than its location. And rest of things were utter worst, from my experience. Reason For Rating : . Reason For Rating : Ambiance is not good. What's Good: This hotel is on the street adjacent to the temple. What needs to improve : there is nothing to like about this hotel. Reason For Rating : The rooms were dirty. we switched our rooms thrice on our 3 day stay No room service guy. Bathrooms were very dirty. Reason For Rating : This hotel condition was pathetic and hotel staff was very unprofessional even who doesn't know how to talk with people, as well as hotel charge was double on online booking Really this hotel facilities spoiled my trip . I strongly recommend yiu to remove it from any only site. Reason For Rating : Remove this hotel from yatra list. Rooms have no window panel ,beds full of bugs, sea water coming from tap.worst thing is on complaint no response from the hotel side even owner attitude is like like threatening us. "go and cancel the booking." never ever dare to book this hotel. haunted house is even better than this hotel. Reason For Rating : Improve cleanliness of room and surrounding Provide clean water for bathing. Lift must be working. Hotel staff should bring luggage. What's Good: Very bad experience. Reason For Rating : Very bad hotel. It's bathroom is very wrose condition, room is also worse condition. Overall this hotel is is not good for stay. What's Good: It was worse. What needs to improve : Staffs and its services. Reason For Rating : There is no towel, handeash soap and chadar to use in night. There is no jug or water bottle to keep drinking water. Lift was not allowed to guest. It was for pne time use to lift bag and baggage of the guest. Reason For Rating : Very worst very dirty. What's Good: Pls do not reserve in this hotel. It is a dump yard. Even the dump yard will be better. What needs to improve : Every thing not liked. Reason For Rating : Worse Hotel , no water in the bathroom , no lift and the behavior of the staff is very rude. I will not recommend any body to stay in this hotel. very Bad experience. What's Good: Flexible check in and check out . What needs to improve : Poor service and unhygienic condition. Reason For Rating : Unhygienic. Poor service. Reason For Rating : Both rooms not yet all clean. Please improve. Reason For Rating : Unwashed Bed Sheets, Disgusting Toilet. Only + is its nearby to Rameshwaram temple and railway station. What needs to improve : I don't like the Hotel. Service is very bad, rooms are really dirty with lizards and Cockroaches. If you see the room toilet, you don't like to pee, normally toilet commode/sheets are white in color but their in yellow color due to dirty it looks they didn't clean it from so many years. Hotel photos shown on the website are not the same as actual. Not like to recommend anyone. Reason For Rating : Hotel is really pathetic, some of the Hotel photos are not legit. Reason For Rating : Room was very much darty and also bathroom was not in a condition to even enter. Reason For Rating : it was very horrible experience for me. room was not clean at all. it was all dusty everywhere inside the room looks like abandon room for a years. every corner of the room has spider web. from window very bad Sewage small was coming inside the room. fell like immediately i should leave the room. later i asked to change the room other rooms condition also like same when i asked to clean the room they asked money for cleaning the room. Reason For Rating : Excellent Location. Amidst Hotels & Auto / Car Stand No Horn/ No Polution Good for Family with kids. Reason For Rating : I have booked for 4 bed in one room, but they provided 3 bed in one room at second floor, but the lift was not working, my old father & mother highly struggle to climb the second floor through the steps. It is a very bad experience. Reason For Rating : Lower than Lowest hotel. If you want to visit doctor then book this hotel. Reason For Rating : Worst hotel they didn't give washed bed sheat and pillow covers also... Room was very dirty and washroom is like a hell... It was bad like station's washroom. What needs to improve : Room condition and cleaning facilities. Reason For Rating : Should ensure basic amenities in hotel. Reason For Rating : Hotel staff and their service are very good. I am having good experience with my trip. Thanks to Yantra for providing service. What's Good: Location with respect to temple. Reason For Rating : Hotels should be required to update their information about available facilities and real latest pics of rooms/property so that customer can get more idea. What's Good: Waste of money. Waste of time. Worst experience in my life. What needs to improve : Stuff.rooms cleanliness, unhygienic toilets and what not. Reason For Rating : Worst ever experience in my life. Staff not so friendly, cleaning staff was extremely untrained and for small work always they ask for "BAKSISH". Toilet, bedroom, corridor was extremely dirty and unhygienic. Bedsheets they replaced with wet and dirt bedsheet. Pillow cover they didn't change even after request so many time. At last we change our hotel on the same day after 3 hours. I made complaint to yatra about the matter on the same day at 9:52am on 25/01/18 for refund related issue,but the hotel manager refuse all those things. Even i request yatra to give me one day refund but they didn't. My whole money,time gone waste.room rent also very high. When we left the room on 25th jan morning with all my belongings,they lend two rooms out of four to other people's. My hearty request you tourist not to book this hotel,you will get more better hotel and so many bhawans on this area. Reason For Rating : The experience even can not be compared to nightmare, worst than that in all respects. Don't ever go near this place, even if you have to stay on the road! What needs to improve : No door for window. Lift is not working. No bed sheet. Lot of mouse and mosquitoes.poor response from owner. Reason For Rating : It was horrible experience. I never stayed in this much worsed hotel in my life. There was severage water logging in Loby. Lift was not working. Toilet was like hell. Bed sheet was dirty with lots of spot and when I requested to change they didn't do it after saying yes. Bad smell was coming from everywhere. Don't trust on Yatra.com.They recommend the hotel without knowing about the property. Reason For Rating : Very bad hotel. Should not have chosen this hotel. Nothing more to say. What's Good: Near to Temple. What needs to improve : NO facilities.. no cleanliness..
What needs to improve : Filthy bedsheets, termite cladded beds and dressing table, filthy toilets, salty tap water and hospitality. Worst & Horrible Hotel. . Worst Hotel I had booked two room for my family for our visit to Rameshwaram on 25 Feb 2018. Usually I don't take the pain posting reviews online, but this time I really felt doing because I don't want any other families experience the same horrible experience in future booking this hotel. * The hotel is not providing any parking facility for four wheelers. We had only two options available, either park our car in a vacant road which was not at all secure considering the surroundings (the place had no light and was packed with street dogs) or park in a parking slot managed by some other agency which was 2.5 Km apart for which they charged Rs.100. * Lift was not working. * Room was very untidy and was giving an impression that it has not been cleaned for decades. * The bed sheet and pillow cover was too dirty. On complaining they told that the dhobi (the cleaning staff) as on leave for 3 days and they could not manage to clean the bed sheet/pillow covers. On multiple request we were just given a single new bed sheet. * The cupboard and the table had the decayed food particles that was left by the left by the people who stayed before. The hotel did not even take it as their responsibility to clean this for us. * The bathroom too horrible. Literally felt like vomiting on entering the bathroom. It was not clean and very unhygienic. The tap was leaking and the bucket was broken and dirty. * I think they are pumping the sea water directly to their water tank. The water was too salty that we had to buy water bottles to brush our teeth in the morning. Overall it was a hell. Never ever will forget this experience in my life time. So friends, please beware. Stayed in this place during my solo bike trip to Rameshwaram. Not many hotels allow solo travelers. Fortunately this hotel allowed single occupancy, located at the centre of the town, online payment facility available. A budget hotel. Temple is very near so the location is very good. Room size i medium. Service by the staff is good. Ambiance is ok. Nice place to stay for nominal rate. Restaurant offers good food. Best for people travelling in budget. I booked a room in this hotel at Rs100/- premium at Rs.800/- for non AC triple bed room with sea view 1 month in advance for two days 27-29 Dec.16 and also sent them Rs.1000/- towards advance. Thereafter I had been in contact with the owner thru WhatsApp quite regularly even enroute to Rameswaram from Madurai on the date of arrival. Even then the owner kept me waiting for the room for an hour in the lobby where there was only two chairs and the time was around 11 PM. When insisted to hand over the room as my small child was falling asleep, they ultimately gave us a room as booked, but to utter surprise we found the room was completely devastated in the evening thunderstorm and heavy shower. There was water everywhere on the floor and the mattress was very much wet. The room was really in a very very bad shape and in poorly maintained or even never maintained at all. The toilet was so dirty and was having only a zero power dim light. Room does ot have any wash basin. The head board of the bed was having torn padding. The mattresses were with holes from someone's cigarette. The bed sheets were stains with either rust or blood stains. The lift was so poorly maintained that it had heavy cobwebs everywhere inside the cart. That too got stuck when was running on generator. We had been trapped inside with our little baby for more than 10 minutes in a suffocating condition even after refusing to go by lift and had to travel upon their insistence. They were unable to provide a few dry pillows and a few clean bedsheets and mattresses. Finally they decided to shift us to their upcoming property on the other side of the temple and we had to walk down there through dirty broken lanes with overflowing sewer lines in complete darkness. Upon arrival to their new property called New Island Star, there was sleeping staffs who did not wish to provide us room and refused to start genset. The owner did not pick up his phone at that odd hour when we were in a extremely critical situation with our child had fallen asleep out of exhaustion as it was then around 1.30 am at night. We dicided to go back to the older property as there was atleast light and fan, and at that time, electricity resumed and we stayed there in the New Island Star, but after checking-in, light went off again and I had to guide the hotel staff in starting the genset. The owner only prefers to charge money due to his very centrally located property but does not even prefer to spend a single rupee towards maintenance. There were signs of no maintenance everywhere and for that he was not at all ashamed of, but he only justified that it was a mere "budget hotel". On the other hand, there were several other hotels in the same row, who could offer better maintained rooms at the same price, though some of them do not offer rooms online. On the next day I preferred not to stay there for another night and therefore asked the owner to refund me one day's rental and he tried to deduct Rs.1000/- for the room provided in the New Island Star, but somehow I managed to take complete refund of Rs.800/- as it was his fault as he could not provide me a room in order even in case of prior booking. I hereby warn all the travellers to think hundred times before thinking of to book room in these hotels. PLEASE DO NOT FALL PREY TO THEIR LUCRATIVE WEBSITE AND WHATSAPP MESSAGES/ CONVERSATION. Hotel has sea view like others in the same row.